All fraud and racketeering charges brought against an auto body shop owner were tossed Monday by a Macomb County judge who said the case “should have been dismissed” earlier, the Macomb Daily reported. 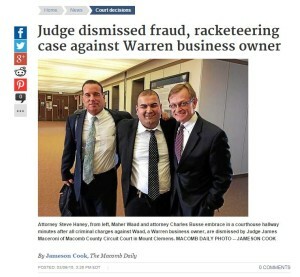 Judge James Maceroni dismissed the six counts of false pretenses and a racketeering charge, calling the evidence “simply not there,” according to the newspaper. However, he was also “stunned” by Waad’s alleged business practices, according to the newspaper. Maceroni said there was no proof Waad even knew about the activities of which his company had been accused, according to the Daily. Waad told the newspaper he’s hired more managers and has been giving his business greater scrutiny since the case. Waad’s attorney said the whole case was just a civil billing dispute and details given to police by Farmers might have been retaliation for Waad’s federal lawsuit alleging defamation, discrimination and steering by the company and three other insurers , the Daily reported. Farmers said it doesn’t comment on pending litigation.